A delicious, and low carb alternative to a lunch cart favorite. These stuffed peppers have a hearty flavor that will satisfy even the hungriest diner. Even the kiddo’s dig into these, how fun to eat out of an edible bowl! 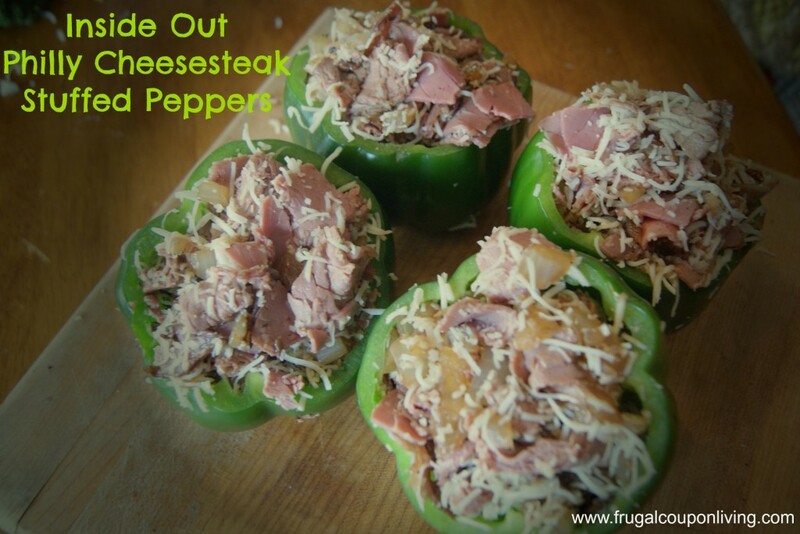 These would also make a great drop off dinner for a new momma and her family, or to bring to a potluck dinner. Additional diced green peppers if desired. Dice roast beef and set aside. Slice tops off peppers, and remove all seeds. Dice onion. Heat 1 Tbsp. olive oil in a nonstick skillet over medium heat. Saute onion until caramelized(until it has started to brown and soften) if you want extra peppers or mushrooms add them to pan with onions. Turn off heat. Add broth, salt, pepper and Worcestershire sauce to pan, stir to combine well, set aside to cool. In a large bowl combine; chopped roast beef, cooled onion mixture, and entire bag of shredded mozzarella. To freeze place stuffed peppers in freezer bag, upright, and place in freezer. To cook peppers, remove from freezer, place peppers in a pan sprayed with nonstick cooking spray, allow to cook 20-25 minutes in oven preheated to 400°.